SRINAGAR: The Peoples Democratic Party (PDP) on Thursday urged the Governor N N Vohra the need of defending Article 35-A in the Supreme Court for state's overall prosperity and tranquility, a day after it had decided that senior leader and MP Muzaffar Hussain Baig and party counsel will fight the legal challenge to the validity of Article in the top court on the next date of hearing. The PDP’s top leadership had met on Wednesday at president Mehbooba Mufti’s residence wherein was decided that it will remain in the forefront to defend the special position accorded to the state of Jammu and Kashmir by the Constitution of India which is currently challenged in the Supreme Court. The meeting had decided that Veteran PDP leader and MP from Baramulla Muzaffar Hussain Baig along with party's legal counsel will fight “the assault being launched against the state's special position in the Supreme Court of India and will remain present in the court on next hearing slated to be held on August 27." Baig, an alumni of Harvard Law School, served as the advocate general of Jammu and Kashmir from 1987-89 before joining politics. On Thursday, a delegation led by senior leader Abdul Rehman Veeri and comprising of senior leaders Ghulam Nabi Lone, Ashraf Mir, Mehbooba Beg and Nizamuddin Bhat called on Governor Vohra here and emphasised the need to defend Article 35-A, which guarantees special status to the state, before the Supreme Court. "The delegation conveyed to the Governor their concern over the offensive being launched against the special status of the state and also underscored the need of defending Article 35-A in the Supreme Court for state's overall prosperity and tranquility," a spokesman said. The delegation also highlighted the need to defend the Article in the Supreme Court with the same seriousness as was exhibited by the PDP when it was the part of government in the state, he added. 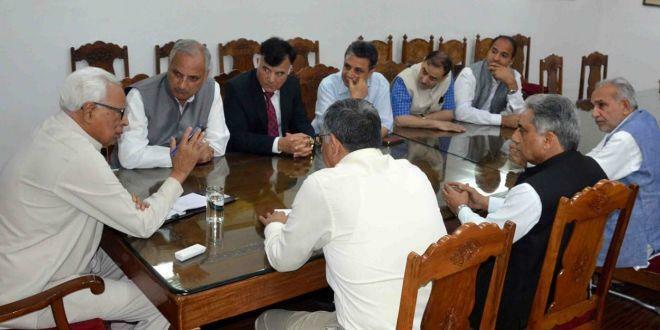 The PDP leaders expressed hope that the Governor administration will take similar measures to defend the special position of Jammu and Kashmir in the top court of the country, he said. The delegation also pitched for speeding up of the developmental projects in the state that were executed during the tenure of PDP led regime, he added. Earlier in Wednesday’s meeting it was highlighted how the PDP while being part of the coalition with the BJP took "drastic and vital measures" for the defence of Article 35-A and the government had engaged the top lawyers of the country for the purpose. “Mehbooba emphasised that the fight to safeguard Jammu and Kashmir's special status will be carried forward with the same zest,” chief spokesman Rafi Mir had said. The Supreme Court had, on August 6, said a three-judge bench would decide whether the pleas challenging Article 35-A should be referred to a five-judge Constitution bench for examining the larger issue of alleged violation of the doctrine of basic structure of the Constitution. The bench comprising Chief Justice Dipak Misra and Justice A Khanwilkar had adjourned the crucial hearing on as many as five petitions "to the week commencing from August 27" on the grounds that they pertained to the challenge to a Constitutional scheme and could not be heard as the third judge, Justice D Y Chandrachud, was not present on that day. Article 35-A, which was incorporated in the Constitution by a 1954 Presidential Order, accords special rights and privileges to the citizens of Jammu and Kashmir.